And her world travels have also informed Angelina Jolie's parenting perspective. Actress, mother, humanitarian, and now filmmaker: All are titles that have applied to Angelina Jolie, who’s made her behind-the-camera debut as the writer and director of “In the Land of Blood and Honey," for which she's received a Golden Globe nomination. In the second part of PopcornBiz’s conversation with Jolie, the superstar reveals how making the movie and her efforts toward international peace have affected the lives of herself and her family. Your family travels the world and your children have likely seen and experienced many things that children their age will not. How open or straightforward are you with telling your kids about the problems in the world? Very straightforward. My children have been to post-conflict situations and they’ve been to refugee camps with me. And for example, Maddox would go to the place – we have the, say we have a house in Cambodia, it’s not a house: it’s a room on stilts surrounded by a hundred Cambodian people that work with us to secure these 5,000 villagers. And it’s a project in the middle of the jungle. We found 48 landmines on our property. We have neighbors that are landmine victims. And the kids play with local kids and they swim in the pond. So it’s a part of what they know, it’s a part of their life. Pax is from a country of conflict. My children’s birth parents probably all fought in some way or dealt with conflict a little bit more. So when I go on U.N. missions, I always sit down with them and explain to them why I’m going. So how is your childhood different from the childhood you’re creating for your children? 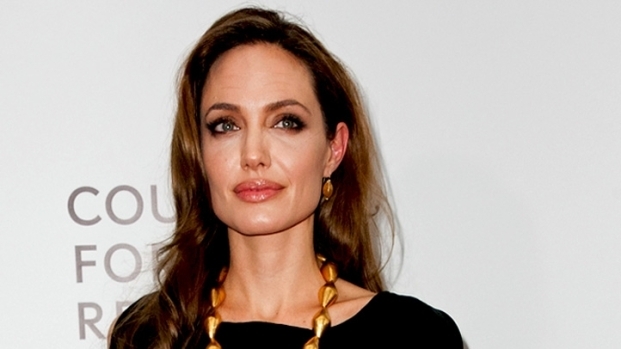 Angelina Jolie discusses her directorial debut, her family, and reveals a secret about herself. Well, I’m trying to make them just more global. My mother, as open as she was, we just didn’t travel as much and she always taught me to be a good person. She was always interested in things. She took me to my first Amnesty International dinner when I was 9 ... [But] we didn’t travel, we weren’t at home in the world, our world was smaller. So with my family, I’m trying to raise them to have respect for all people and make friends around the world and feel at home with the world and really live a truly global – because I think it’s what forms them and it’s really important to me. And I make sure they do their math and their science, but that is the most important thing for me. Regarding your regular routine as a mom and an actor, what did you sacrifice to make this film? Well, I would never sacrifice any time with my family. Brad and I, if we couldn’t manage our schedules, we would always sacrifice work, so I stayed with him while he was doing “Moneyball” in L.A. with the kids and I did the prep for this film mostly here. I only traveled for two days and I came back. I kept doing that because I couldn’t leave my family for a long time. So I had a very scattered prep, and I only had three days in country before I started shooting because I had to stay with my family. And Brad’s film went over [schedule] so I had to push back. We had three days where I was completely there and then I started and he was there a week later. So we just do everything we can to try to stay together, and through the film my family was there. So he took the kids to school and after school they came to set and we’d would usually stay outside of the set and play with the fake snow and try not to come anywhere near the camera because it’s an inappropriate film for them to be near. Was Brad a sounding board when you were writing the script? Yeah, he was the first person to read the script. Probably if he would have said anything negative, we wouldn’t be here today [Laughs]. I just kind of showed it to him as just this experiment that was on my desk, and he took it with him when he did a two-day thing in Japan and then he called me and said, “You know, honey, it’s really not that bad – It’s pretty good!” And we talked further about it and he encouraged me through the whole process and he came to set on most days and did some still-photography for the film. He was always around and always supportive. What did you learn and discover through this production? Were there any life lessons? I think doing anything having to do with war, you walk away so very grateful for everything you have, and the safety that you have. But you also are very conscious that all the issues in this film are going on today in other parts of the world. Violence against women and lack of intervention and man’s inhumanity to man and this kind of atrocities are going on as we speak, so there’s a lesson in that we must speak out about these things. These are big issues of our times: we must speak about them, we must learn how to better understand how these things happen so we can address them. You’re known for your compassion. Was there a moment where you realized that was the way to live life and something that crystallized that intention? The life changing moment for me what the first time I went to a war zone and that was Sierra Leone. I took two weeks, 11 years ago, and I went. I wasn’t an ambassador or anything; I just asked to go and I was allowed to go. And I spent time in Sierra Leone and I witnessed such a brutal conflict, where they cut arms...And seeing little kids who had both their arms and legs cut off with a hatchet and a hatchet stuck to a tree. I could not for the life of me understand how this was happening, and it was like someone smacked me in the face. For all the times that I worried about my own problems or thought that I had any – or was not grateful or ever woke up, because in this country for the freedom that we have and the safety we have, we’re so far from what the majority of people are living. Of course, there’s extreme poverty in this country and that should never be ignored and that should be addressed, but across the world, there are these places where people literally cut hands off their brother or sister... It is beyond – so that and I went to Tanzania and I saw my first mass refugee camp because there are about 500,000 people at the time. And when you see that sea of humanity displaced with the lack of human rights and not knowing what their future is. It’s just so daunting. I was in complete shock by the time I got...I didn’t cry, I think I stayed quite still and totally in shock and by the time I got to the airport, I broke down. I talked to my mother on the phone and decided that I would just try to live a better life and never ever forget what I have learned. Beside this film, which obviously had a very profound effect on you, is there another film that had that kind of effect on you? I loved doing "A Mighty Heart," which was the Daniel Pearl story. I loved that because I loved her [widow Marianne Pearl's] message. And I think her message of tolerance and forgiveness is very important. I don’t know if I could be as gracious, personally. And I’ve come to know her family and her son so it was very important for me, that film. And I loved Michael Winterbottom’s directing, I thought it was just a great experience as an artist. When are you the most happy? Being a mom. Often I’m happy whenever I’m with my children, but there was a moment where we had just finished work in New York and Brad and I were piled in the car with the kids and we’re listening to Christmas songs and we were laughing and playing games in the car, and I looked at Brad and I said “This is one of these moments, isn’t it? This is the moments we live for.’ And so it’s that. You just catch yourself sometimes and you look around. I’m so fortunate; I love my family so much. And they’re such a funny, interesting group of people. Did those maternal instincts ever show up with your cast and crew at all? Probably. Well, probably in the sense that you’re always answering to somebody with something. [Laughs] When you have six kids you’re just used to 'What’s next? Who else?' So I think the natural multitasking that comes with being a mother works well and transitions into being a director. I think I’ll be working less. My kids will be needing me a lot when they hit their teens. [Laughs] If I know anything about being a teenager, I need to be braced to be spending a lot of time with all six of them and making sure I can be there for when they go through everything. So I’m sure I’ll be working less or working from home in some way. Maybe I’ll get to write or something.